After nearly 24 hours of travelling, I made it to Kigali perhaps a bit smelly, but otherwise unscathed. Upon emerging from the baggage claim, I was greeted by Dr. Apio (Anna) and her husband, who is also a wildlife biologist. They shared a cab with me to the Hilltop Hotel, a small, rundown place that was nothing to write home about but definitely adequate for the night. My first order of business was to shower- it is amazing how gross you feel after 24 hours spent on planes and in airports, and equally amazing how quickly you feel human again, even after a cold, somewhat awkward shower. We then went to dinner at an Italian place- the pizza was pretty good but the service was extremely slow. There seemed to be only one waiter for the entire restaurant, which was packed to the brim with what I assume were mostly either expats or travellers like myself. They tell me that it is the finest restaurant in Kigali, which says a lot about Rwandan standards for service. The next day, Fronski and I went to town to buy some essentials and change money. I purchased a USB stick for mobile wifi which is how I’m able to post this blog entry. The most economical way to buy internet hours is to purchase one day’s worth for 800RWF (one American dollar is roughly equal to 600 Rwandan Francs). Thus, I will not be able to go online every day, but I should be able to access the internet a few times per week. After our shopping trip, we traveled by private car to Nyagatare. The most striking thing about the Rwandan landscape, besides the beautiful rolling hills, is that there is almost no habitat that is untouched by humans. Houses and farms lined the road for the entire trip- the epitome of sprawl in a developing nation. It is sad that all of this land that was once forested mountains like those in the Congo has now been decimated to terrace farms with horrific soil erosion. The most impressive thing about our journey was the condition of the roads- until we were very close to Nyagatare they were all paved, and even the dirt roads in Nyagatare were relatively well maintained. There are more potholes on a one-mile strip of the Long Island Expressway than I experienced on my entire trip. The Nyagatare District is in what is considered the Akagera ecosystem. In fact, until the late 1990s, it WAS a part of Akagera National Park, which still exists today but in a reduced form. The park was reduced in order to accommodate the large number of refugees after the 1994 genocide. The area is (or should I say was) composed of what the average person thinks of as “Africa-“ rolling grasslands interspersed by acacia trees and filled with all of the famous wildlife. Sadly, since the park has been dissolved, there are no lions left (most were killed by angry livestock owners, and others were pushed out) and the ungulate species exist only within the confines of the park. There are plans to reintroduce lions to the park sometime this year, but it is uncertain if and when that will actually occur. By African standards, my accommodations are very comfortable. We have power (usually) and running water (usually), and even hot water when the power and water are working at the same time. 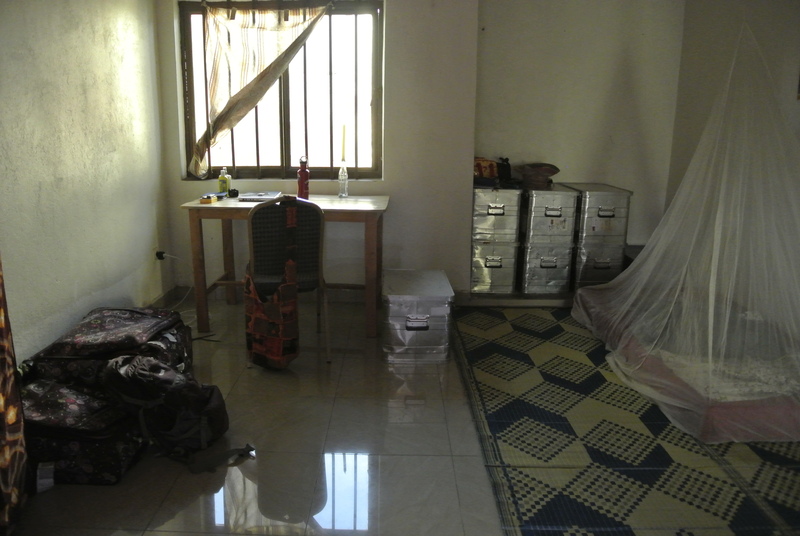 I am staying in the guest room in Anna’s house, where I have a desk, a private bathroom, and a mattress on the floor complete with a mosquito net. I will, however, confess that I am currently writing this by candlelight, as the power went out earlier today. It has gone out a few times since I’ve been here, for a few hours at a time, and apparently this is the norm. Either way, my accommodations could have been much worse, and I do not think this will be an unpleasant place to spend my summer. Posted 5 years ago by Ginny.